Timmi In Tangles | GetLitt! 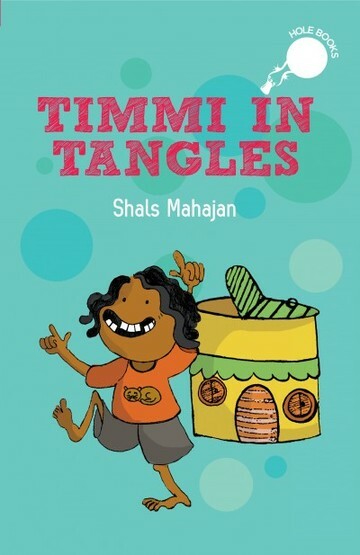 Timmi's life is full of tangles: Her mother expects her to go to school even though she's a raja; Idliamma eats up all her idlis and everyone thinks Timmi ate them ... and why can't people understand that if you have a giant for a friend you can lift the roof to let the rain in? This book is amazing and creative. I loved the way how Timmi imagined to be a king . This book is also very funny. I really enjoyed this book. I loved this book due to the imagination of Timmi. This book was very creative and the storyline was hilarious. The illustrations of this book are incredible and capture timmi’s moods perfectly. The synopsis of the book is hilarious talks about just how funny this book is. To me,Timmi is the hero to her own story.